Sri City, February 24, 2017:- Mumbai based Parksons Packaging, one of India’s leading manufacturers and exporters of printed and laminated folding cartons, inaugurated a new folding carton plant in Sri City on Friday. 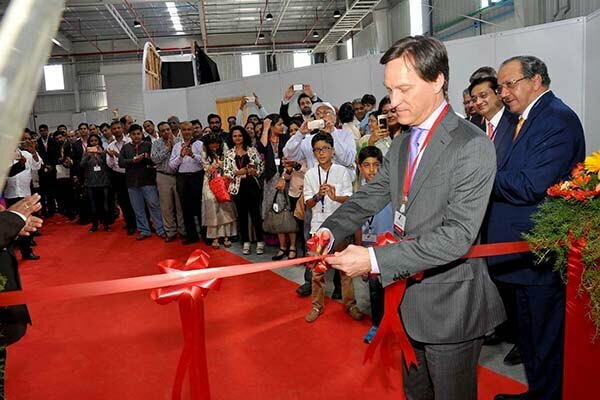 In a colourful function, marking the start of commercial production, Mr.Ramesh Kejriwal, Chairman of the company along with Mr. Jean Pacal Bobst, CEO, Bobst Group, Mr. Stephen Plenz, Head, Equipment Div of Heidelberg group, inaugurated the plant in the august presence of a host of other luminaries of Print & Packaging industry. Bobst, world’s leading suppliers of equipment and services to packaging and label manufacturers, and Heidelberg, a German manufacturer of precision offset printers are the technical partners of Parksons. as they have units in these regions of the country. Currently from its four state-of-the-art manufacturing units across India—one each in Daman and Chakan (Pune) and two in Pantnagar (Uttarakhand)— Parksons manufactures 10 million packs daily for its clients. Next month their sixth unit will be inaugurated in Guwahati. With over twenty years of rich experience in the printing and packaging, Parksons has a rich portfolio of blue-chip clients spanning different sectors, such as Fast Moving Consumer Goods, Food & Beverages, Pharmaceutical, Electronic, Retail, Apparels and other white good industries. Its key customers, among several others, include Mondelez, Kellogs, Colgate, HLL, L’Oreal, Godrej, McDonald’s, Wockhardt, Hindustan Unilever, Emami, Sun Pharmaceuticals, Ranbaxy and many more. Parksons revenues jumped nearly ten-fold to Rs 476 crore in FY2015 from Rs 57 crore in 2005, and branded packaging for FMCG and white goods firms account for about 70 percent of its revenues.